Admittedly the blood is a little much, but this isn't really about the blood. Tell me i'm not the only one who has noticed this! How can a paw with five non-retractable claws strike that hard ACROSS one's face, and only leave one mark DOWN the face?? The physics don't make sense here, even as a kid i was confused by this. 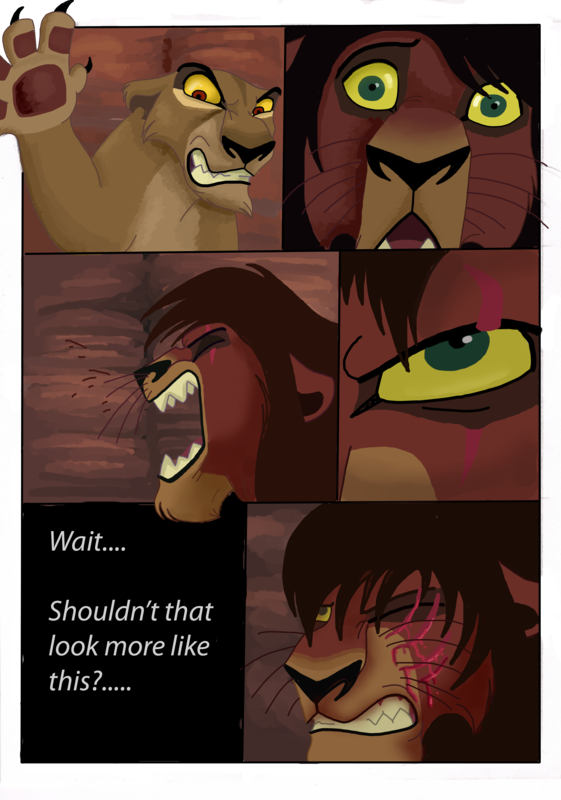 This is another reason why i don't buy into most theories surrounding Scar getting his trademark wound by being scarred by another lion, for the same reason as i have illustrated. As much as i hate the 'water buffalo' (Boma) theory from the 'Six New Adventures' books (which I despise), i will admit it does make more sense physically. I know they were going for the 'cruel irony' angle here, but to get a mark like that on Kovu's face, Zira would have to: extend one claw, keep his head still; make sure he keeps his eyes closed (so she doesn't scratch them out) and strike down his face in a perfect straight line. Which in the heat of the moment would look...ridiculous. I know it's kind of stupid to try and put logic and physics in a Disney sequel, but i'm just pointing out something that has bothered me since childhood. *UPDATE* Wow! Looks like most people have noticed this in the movie! I'm quite relieved, at least i'm not going nuts then. Even as a kid that stumped me. I really can't explain it, aside from the production team wanting to juxtapose Kovu to Scar, especially since this is THE LION KING we're talking about, which has more death and injury than you can shake an ostrich leg at. Yeah but it’s Disney, they have to make it suitable for kids. The first film had Simba scratch Shenzi across the face, and the appropriate three marks appeared. No blood obviously, but it's the shape of the scarring that I'm nitpicking, not the absence of blood. "extend one claw, keep his head still; make sure he keeps his eyes closed (so she doesn't scratch them out) and strike down his face in a perfect straight line"
This is part of what inspired Tass and I to make our theory on Scar's scar. A mark as clean as that definitely could not have been caused by something erratic like an attacking lion. You're right. 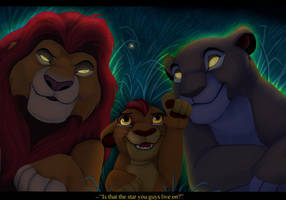 This is how Kovu should've look after a slash like that! I'm actually going to have this in my story. 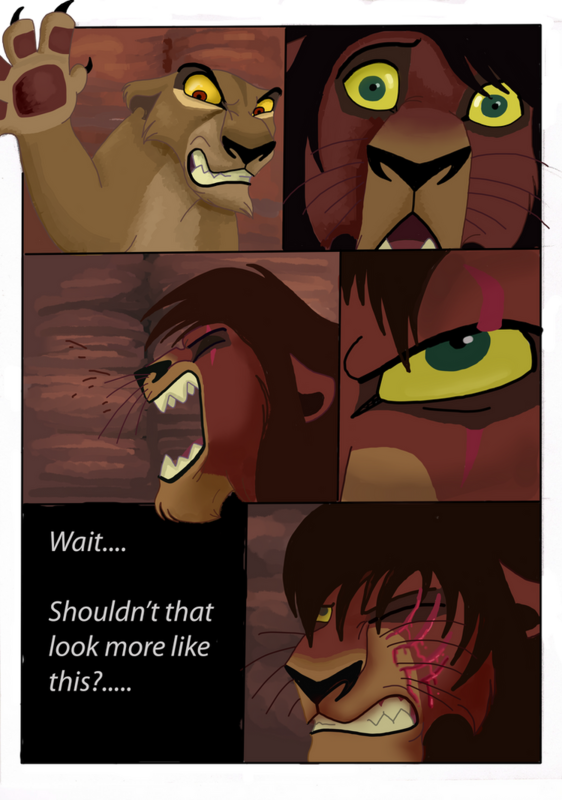 Zira slashes her claws across Kovu's face after he let my OC Jay get away, causing him to lose his eye. my cats manage to tag me pretty hard but somehow not every claw snags. Guess I can't really explain it well, but it might just be plausible. Maybe to do with the angle of her paw and the contour of his face? If they extend their claws then it's gonna hurt, if not then they're simply batting you away as a warning (assuming that it is a warning). A well-done recreation of that scene! This bothered me too. XD Although, for my interest when I was a kid, I used to go through scenes on the original Lion King frame by frame to see how they moved (on VHS you could do that by simply holding down the pause button, IIRC, and it would slowly move through the frames for a bit). I did it to this scene, and it turns out that Kovu moves his head up quickly as soon as Zira's paw is seen covering it, so the angle was accidentally right enough to scratch his eye...but played normally it DOES look like his movement is caused by her slap. x3 Animation can be a tricky thing. Zira: You should kill Simba! 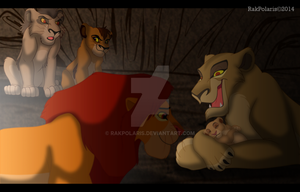 Kovu: Why, "Mother"? Just because you wanna be the queen of pride? Zira: Don't talking like that with me! 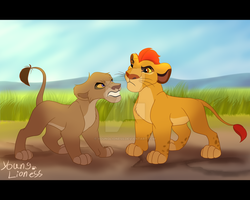 Kovu: I hate you! I hate all you both! The only who I really love and care is Kiara! I guess he moved his head diagonally at the last minute and only one claw his his face?? You know... You got a point there. Ouch. But yeah, that is more realistic. 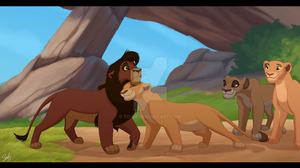 If Zira could Firebend and swiped her claws at him, then Kovu would've really looked like a lion version of Zuko. Great artwork, by the way. I think the point was that she had given him the same scar as scar. That's why she looked so shocked when she was the mark she had left behind. I know that. I wasn't questioning why, I was questioning how. Now I bet this'll be Scars new look in the upcoming remake, more or less. Guess his name will be "Scar's"
Of they'll just go back to "Taka"
Those books were a colab' and when they were around; they were as much cannon to as the movies. She fargotten to polish one claw. Agreed, apart from her having to be careful of his eye, I think Kovu's reflexes (closing his eye, jerking his head away) would be good enough to keep him from losing his eye. Sometimes only one claw gets hook, despite all claws being out. As for the placement, I can't explain. You were one heck of a kid. Your special. I like that. Same. First time i saw that part, i closed my eyes so i wouldnt see the blood. I open them and am VERY confused to see one little scratch and im like "I closed my eyes so i wouldnt see the blood, where dafuq is all the blood?!!" Okay i didnt say dafuq because i was 10 but still i over estimated, as usual.